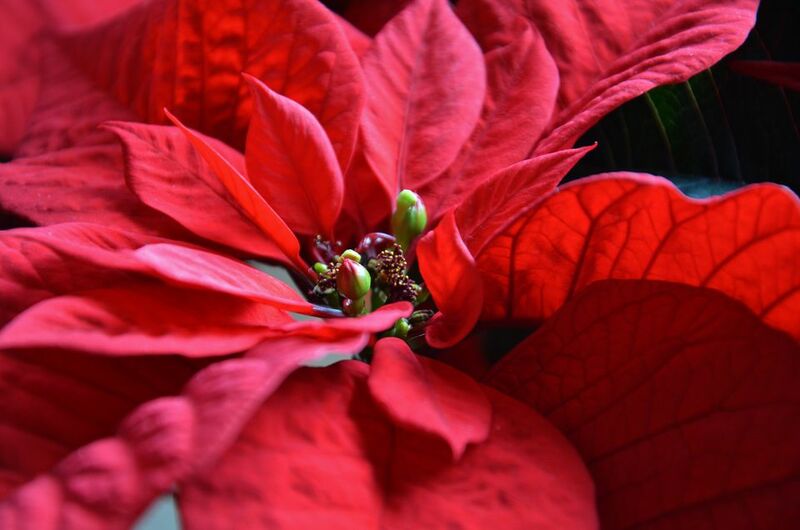 The showy bracts of poinsettias are what consumers look for in poinsettias, not the flowers. Why is this important to the consumer? If the plant you purchase doesn't have an abundance of showy flowers, don't expect them to emerge once you get the plant on your windowsill. Growers use an exacting process of light and darkness control to trigger bracts to color up, so what you see at the garden center is what you get. The flower clusters in the center of the bracts should have little or no pollen showing to guarantee the longest lasting flowers. A red poinsettia in a foil-wrapped container is still the norm at grocery stores and garden centers in December, but plant-savvy shoppers gravitate toward innovative combos that feature their favorite holiday flower. Live poinsettias accented with cut evergreen branches and natural or white painted birch branches complement a winter motif. Poinsettias are drought tolerant plants that pair well with succulents for an on-trend look. Dwarf poinsettia varieties tucked into a giant hurricane glass terrarium with mosses and driftwood are gift-worthy plantings. Although red poinsettias continue to be the top sellers in December, novelty poinsettias offer decorators a wide palette to complement any home interior. Natural poinsettias in every shade of red, white, pink and salmon are available, while the marbled varieties add zest to holiday arrangements. Poinsettia displays in the shape of a tree are common in public areas around the holidays, but can you replicate this idea on a smaller scale in your home? You can buy poinsettia tree racks in full round or half round shapes starting at three feet tall for your entryway or living room. If you aren’t sure which poinsettia varieties to buy to fill up your rack, consult the National Poinsettia Cultivar Trials. Here, you can tap into the research and testing efforts of three universities and five breeders to discover the best poinsettia varieties for decorating and gift-giving. Gardeners who can’t get enough poinsettia eye candy from their local florists and nurseries should consider seeking out a regional poinsettia show. Baltimore’s Druid Hill Conservatory hosts an annual poinsettia show, with some plants offered for sale. Midwesterners can check out Lauritzen Gardens in Omaha, which puts on a family-friendly poinsettia show featuring more than 5,000 poinsettia plants, model trains, and live holiday music. Can you imagine growing a poinsettia specimen like this one in your garden? You can, if you live in a frost-free climate. In tropical areas, the poinsettia plant becomes a woody perennial that can grow up to 10 feet tall. Plant them in full sun, and keep the soil consistently moist. Fertilize the plants monthly with a balanced flower fertilizer during the growing season. If the plants receive 14 hours of total darkness each night for at least six weeks, you may get your plant to rebloom. If you needed an excuse to legitimize your excessive poinsettia purchases, mark your calendar for December 12, which is National Poinsettia Day. Why did Congress mark December 12 to honor this flower? That is the anniversary of the death of Joel Roberts Poinsett, the U.S. ambassador to Mexico who introduced the poinsettia to the United States in 1825. Brides planning a winter wedding should explore using poinsettias in their flower arrangements. The potted plants are inexpensive choices for the wedding ceremony and reception, but florists can also include cut poinsettias in the bridal bouquet and bridesmaids’ bouquets. Consider using some of the new marbled varieties for a contemporary twist on this classic holiday bloom. Perhaps after the long-sought after blue rose, the second most desired blue flower is the poinsettia. You can find these, and other exotic hues amongst the poinsettia offerings this year, but the colors aren’t nature-made. Florists use special nontoxic dyes and an ethanol-based solvent that won’t harm the bracts to create these rainbow alternatives. Poinsettias will never be recognized as edible plants, but nor are they the toxic nemeses many pet owners make them out to be. The natural latex present in poinsettia sap may cause irritation to a pet’s mouth, but consumption of the leaves won’t cause anything more than a mild tummy ache. In fact, a research study at Ohio State University found no evidence that any part of the poinsettia plant is toxic to humans or animals.